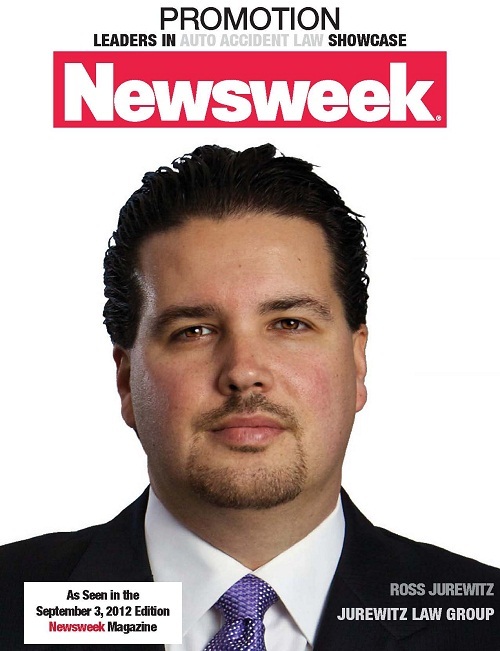 The Jurewitz Law Group is very proud to announce that our own personal injury attorney, Ross Jurewitz, was featured in the September 3, 2012 issue of Newsweek® magazine. He was showcased nationally in the 2012 Nationwide Leaders in Auto Accident Law that is published once a year with over 14 million readers. Newsweek® researched and only contacted firms around the country that were considered to be in good standing with distinguished law associations or have been recognized for excellence by their local media. There were nine different law firms nationwide showcased as leaders in auto accident law. Founder and active attorney of the Jurewitz Law Group, Ross Jurewitz, was nominated as one of two San Diego County attorneys featured in this edition of Newsweek® magazine. Specializing in personal injury, Ross Jurewitz has been practicing law for over 10 years. Both he and the Jurewitz Law Group have been recognized throughout the United States in publications as a leader of auto accident law and personal injury law. He is currently licensed in the State of California to practice law. All of us here at the Jurewitz Law Group are very excited and honored to see all our hard work seen in such a distinguished weekly news publication, which ranks as the second largest weekly news magazine in the country. We are humbled and motivated to continue providing the best personal service to give our clients peace of mind that we will get them the best results possible. We want to give a huge congratulation to Ross Jurewitz for this major career achievement and pat ourselves on the back because of our proud association with the Jurewitz Law Group.